Baird & Warner Inc., the Chicago area’s second-largest brokerage, has released a new version of its website featuring a vast, new neighborhood section complete with in-house videos, professional write-ups, and neighborhood info and ratings powered by StreetAdvisor. The changes, which include a simplified design site-wide and streamlined home search filters, were prompted by extensive research on buyer and seller online habits and behaviors, Jennifer Alter Warden, president of residential sales at Baird & Warner, told Inman News. The neighborhood section has been enhanced with original write-ups by professional writers for over 120 neighborhoods on the site, Warden said. In addition, 40 neighborhoods include in-house-produced videos. 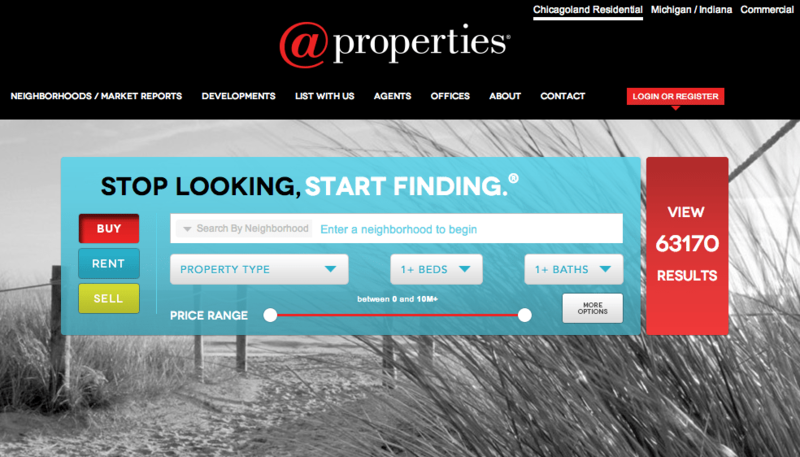 For Chicago proper, consumers can find details on 103 neighborhoods on the site. “We wanted to give more color on what it feels like to live (in a particular neighborhood),” said Peter Papakyriacou, vice president of marketing for Baird & Warner. The site revamp — the firm’s eighth since launching it in 1996 — also reduced the number of search filters on the home page from six to three. Consumers can now search by the firm’s “luxury living” listings, new listings and open houses. The firm also wanted to highlight its agents’ neighborhood expertise with the update, Warden said. That’s where the StreetAdvisor-powered platform comes in. StreetAdvisor, which launched in 2007 as a neighborhood information site powered by those who actually lived in the communities they reviewed and rated on the site, released a broker-focused version of its platform in 2012. The broker version, StreetAdvisor Pro, allows brokerages to tap StreetAdvisor’s crowdsourced ratings for neighborhoods and to highlight their agents as neighborhood experts on a white-labeled version of the site. A number of brokerages, including Rye Brook, New York-based Houlihan Lawrence and Cincinnati-based brokerage Comey and Shepherd Realtors, have signed up for StreetAdviser Pro. 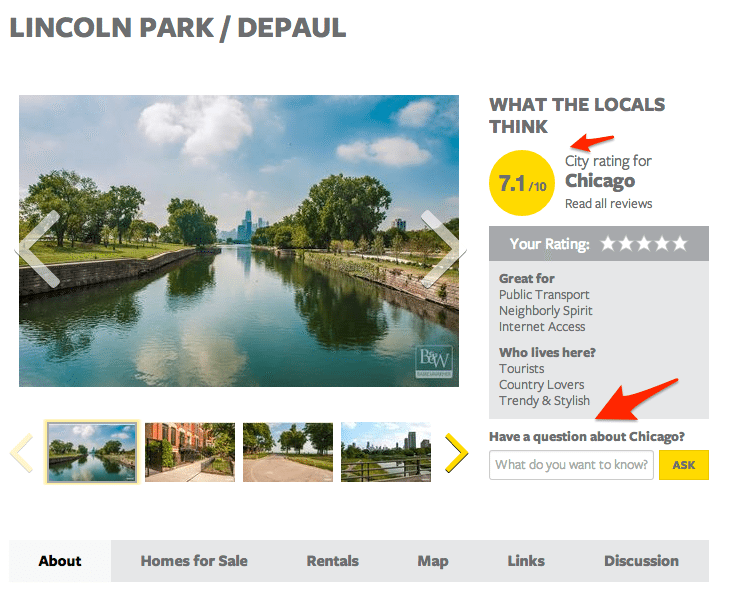 Neighborhood pages on Baird & Warner’s new site, like the one above for Chicago’s Lincoln Park/DePaul neighborhood, include ratings and agent Q&A powered by StreetAdvisor. StreetAdvisor also powers a Q&A platform that allows consumers to ask questions about a neighborhood on the site and receive publicly viewable answers from Baird & Warner agents. Consumers will soon be able to see StreetAdvisor-sourced ratings for each of the approximate 300 neighborhood pages on Baird & Warner’s site and neighborhood reviews by Baird & Warner agents powered by StreetAdvisor, Warden said. Consumers can also navigate to a Baird & Warner-branded version of StreetAdvisor’s site at social.bairdwarner.com. Neighborhood search has been a hot new feature for firms to add to websites. In March, Baird & Warner’s Chicago-based competitor @properties also released a new neighborhood-focused website, complete with map overlays that define neighborhood boundaries, the ability for consumers to search for homes by school attendance zone boundaries, and in-depth write-ups on more than 40 of the metro’s ‘hoods, towns and high-rise condos. @properties’ new site also now highlights a home’s proximity to public transportation and local amenities on its detail page on the site. In 2012, San Francisco Bay Area-based Alain Pinel Realtors released a new website with a design based around integrating consumers’ lifestyle and neighborhood interests in their home search experience on the site. However, some brokerages are embracing other ways to attract consumers. 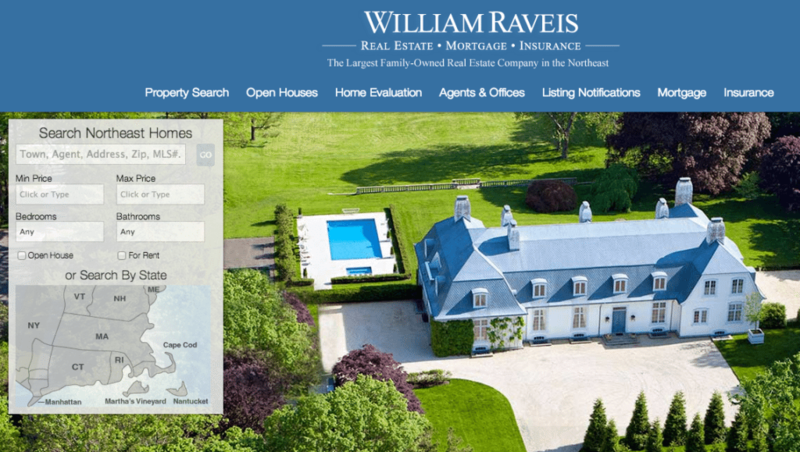 In April, Shelton, Connecticut-based William Raveis Real Estate Inc. rolled out a new site connecting consumers with its people through videos prominently placed on the site and a proprietary market-forecasting tool.